, a divine, philosopher, and civilian of the sixteenth century, was born at Trent, where he was afterwards in orders; but, being disposed to a liberality of sentiment not tolerated there, he went to Switzerland in 1557, and made profession of the Protestant religion on the principles of Calvin. From thence he went to Strasburgh, and lastly to England, where he was hospitably received. Queen Elizabeth gave him a pension, not as a divine, but as an engineer. In | gratitude, he addressed to her his book on the “Stratagems of Satan,” a work in which are unquestionably many sentiments of greater liberality than the times allowed, but, at the same time, a laxity of principle which would reduceill religions into one, or rather create an indifference about the choice of any. It was first printed at Basle, in 1565, under the title of “De stratagematibus Satanae in religionis negotio, per superstitionem, errorem, heresim, odium, calumniam, schisma, &c. libri VIII.” It was afterwards often reprinted and translated into most European languages. 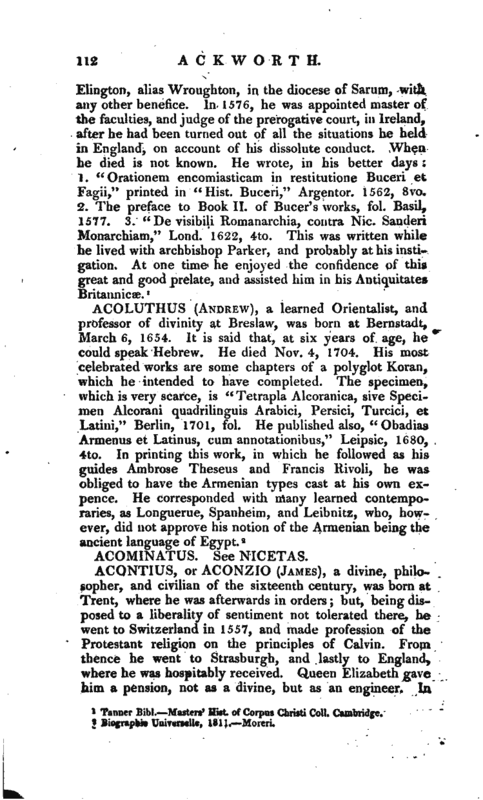 His latest biographer says, that this work may be considered as the precursor of Lord Herbert of Cherbury, and thoso other English philosophers who have reduced the articles of religion to a very small number, and maintain that all sects hold its essential principles. Acontius, however, had his enemies and his supporters; and even the former could allow that, in many respects, he anticipated the freedom and liberality of more enlightened times, although he was, in many points, fanciful and unguarded. A better work of his is entitled “De methodo sive recta investigandarum, tradendarumque artium, ac scientiarum ratione, libellus,” Basle, 1558, 8 vo. This has often been reprinted, and is inserted in the collection “De Studiis bene instituejulis,” Utrecht, 1658. His “Ars muniendorum oppidorum,” in Italian and Latin, was published at Geneva in 1585. 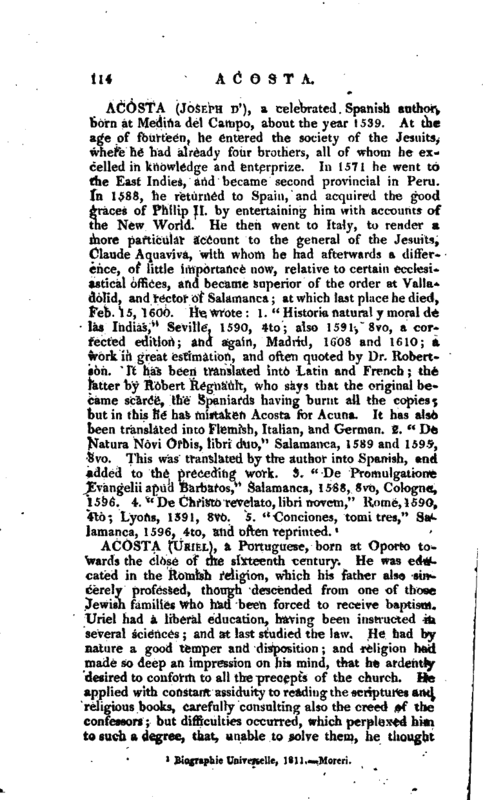 In one of the editions of his “Stratagemata,” is an excellent epistle by him, on the method of editing books. He had also made some progress in a treatise on logic, as he mentions in the above epistle, and predicts the improvements of after-times. Biographie Universelle, 1811.—Gen. 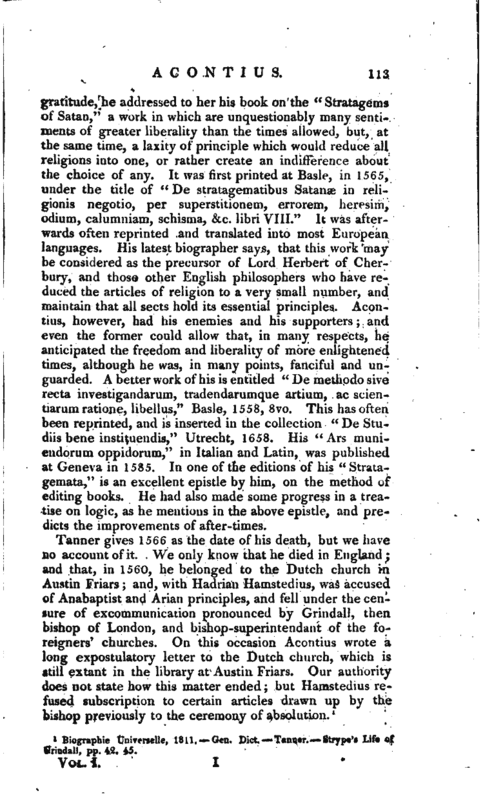 Dict.—Tanner.—Strype’s Life of Grindall, pp. 42. 45.